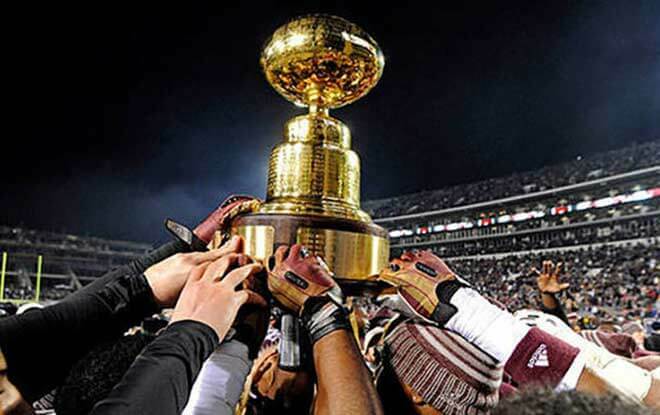 College football betting will make its return this Thursday with an intriguing matchup colloquially referred to as the Egg Bowl. In other words, the annual matchup between Ole Miss and Mississippi State will be held this Thursday. It’s a perfect way to cap off both team’s regular seasons and it should ultimately prove to be an entertaining bout, despite what sports betting websites are predicting on the money line. Let’s take a look at what NCAA football betting fans can expect come Thursday. The Ole Miss Rebels march into this Thursday night matchup sporting a 5-6 record that ranks them 6th in the SEC W, largely in part to the weak -5 record Ole Miss has posted in conference play. The Rebels’ entire 2017 season has been relatively weak with the program failing to win more than 2 games consecutively. Furthermore, the Rebels had no qualms about losing 3 in a row earlier this season. But all things considered Mississippi hasn’t had that terrible of a season considering that half of the team’s losses have come against nationally ranked opponents while the other three have been by 9 or fewer points. Ole Miss is coming off a 31-24 loss to Texas A&M and while it’s left a sour taste in the Rebels’ mouth, this Thursday’s contest represents an opportunity to close out the season on an extremely high note by picking up a massive upset victory over a longtime rival. Most sportsbooks for US players aren’t giving the Rebels much of a chance this Thursday and college football bettors shouldn’t either. The Bulldogs outclass the Rebels defensively and are ranked 16th in the country with some quality wins over LSU and Arkansas. Players should stick to their sports betting tips and bet Mississippi St. The Mississippi State Bulldogs run into this regular season finale flashing an 8-3 record that ranks the program 4th in the SEC West, thanks to the 4-3 record that Mississippi State has posted in SEC play. The Bulldogs have found plenty of success this season but have failed to come up big against the best teams in the conference; the Georgia Bulldogs, Auburn Tigers, and Alabama Crimson Tide. Considering that they’re going up against some bottom-hanging fruit this Thursday, most sports betting tips will correctly advise bettors to the Bulldogs on the money line. Picking them on the spread isn’t a bad option either considering that Mississippi State is 5-1 against the spread at home this season. The Bulldogs are coming off a 28-21 triumph over the Arkansas Razorbacks and will be looking to close out the 2017 season with two consecutive victories – albeit, they’ll be vying for a more dominant performance this Thursday. A quick glance at both teams’ averages will reveal that Mississippi State has the clear advantage over their rivals. The Bulldogs are averaging 32.5 on offense while gaining 412.5 yards and holding their opponents to 19.5 points and 166.9 yards. The Rebels are putting up 33.0 points and 472.1 yards each weekend but they’re also allowing 35.2 points and 455.7 to their opponents. Those numbers make it clear that that -110 payout is worth cashing in on this Thursday.